Very nice and well furnished studio apartment with a small balcony to the south. There are two sofa beds and the apartment is best suited for a couple, a small family with one child or a delegate to one of the many congresses held in Cannes. The kitchen is well equipped and there is a small dinner table for 4 persons. Despite its size, the apartment feels spacious, thanks to the large doors out to the balcony. Whatever you are looking for accommodation for holidays or congress this studio is great value for money. 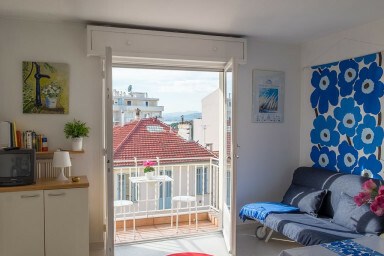 The apartment is located just off the Plages du Midi, just a few minutes walk from the Old Town of Cannes with its buzzing restaurant, the Palais des Festivals, Croisette, the beaches and all else that Cannes and the Riviera has to offer. A short 2-minute walk takes you to the beach where you will find a well-maintained public beach. There are also several beach restaurants offering sunbeds, changing rooms and other services. – Shops for essentials and grocery: Outside the door.